I think I can officially declare another polish sub-addiction. I kinda need ALL of the "splatter" glitters. I lusted after them when they were only done by indies. I pined when Europe (I can't) and Walmart (I won't) got them. I bemoaned the price when Sephora came out with some. I pounced when one showed up at Claire's. Since then, they've just gotten more and more accessible and I couldn't be happier about it! 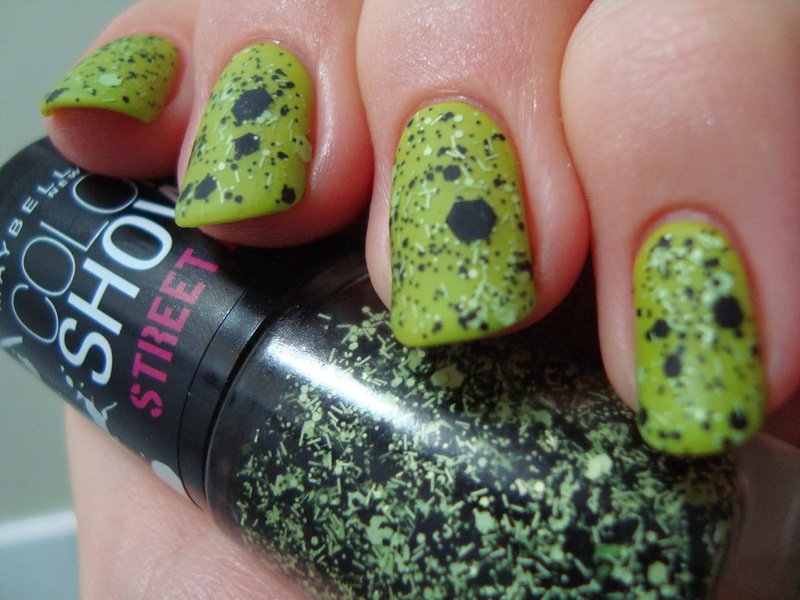 The new Street Art line isn't even Maybelline's first foray into this style of glitter. 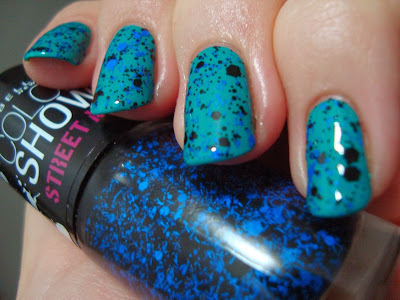 Their Polka Dots line (here too) brought this look to drugstores last summer and now they're back with more! 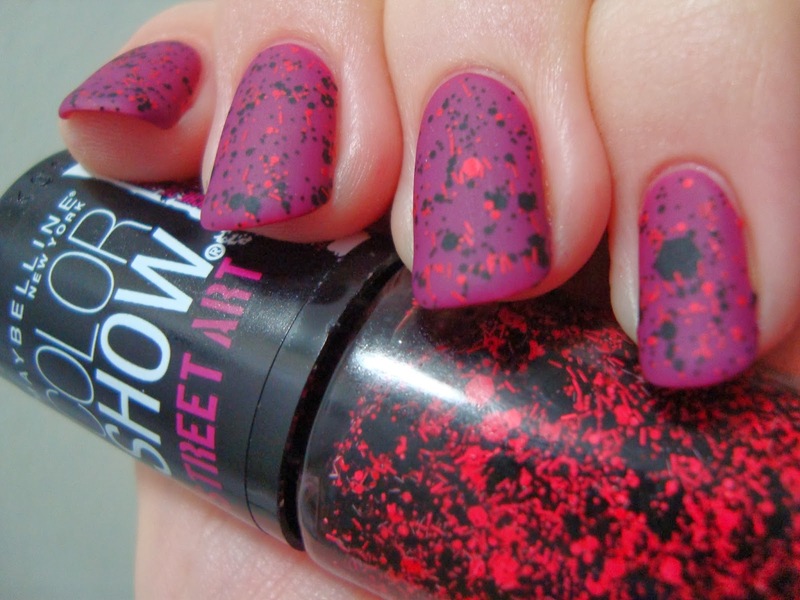 This time there's bar glitter, a splash of color, and no jelly bases. All five have clear bases with hexagonal glitter in two colors (black and a featured color) and four/five sizes (tiny, small, medium, large for both and huge black too) and small bar glitter in the featured color. When I found them at CVS I bought four of the five shades, skipping only Pink Splatter. 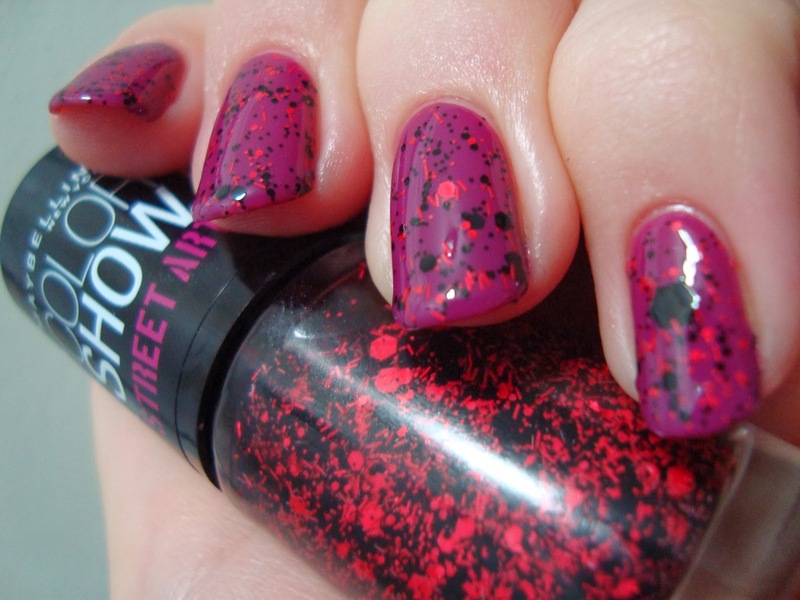 Wild At Heart features pinkish-red and black glitter. It's weird, but the base seemed to be different from one bottle to another or maybe from one shade to another. Wild At Heart and most of the others applied fairly well. It's almost impossible to get the glitter to go exactly where you want it though. I think it's because it's mostly so tiny. They look like messy failures until they're top coated, at which point they look like pure splattery awesomeness. They look even better mattified! Blue Beats has sky blue and black glitter. Did you see that line above where I said "most" of these applied fairly well? This was the exception. The base is considerably thicker for some reason. It might just be my bottle. The photo above shows how uneven the coats were. I had to go back and even things out, as seen below. 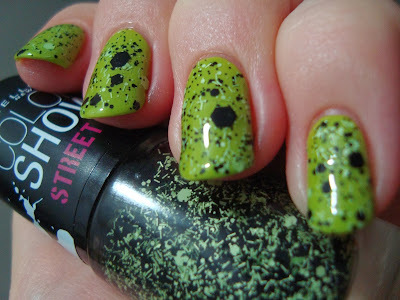 Green Graffitti pale green and black glitter. over OPI Who The Shrek Are You? The shade of green in Green Graffiti is a bit odd, but I think that gives it a lot of potential. It's an interesting pastel mint. It shows up better in this combo when it's mattified. Nighttime Noise has black and vibrant blue glitter. The biggest glitters in these mixes are elusive and I didn't get any at all this time around. The overall effect is the same whether they show up or not though. I mattified this last combination too, of course. Bottom line: I really reeeally like these! They're not the easiest glitters I've ever applied, but once they're top coated they look great! I have soooo many things I'm working on...next week should be crampacked with sparkle and stamping and new stuff and...things! Yay things! I purchased Nighttime Noise from Ulta and now I am super excited to try it!